Rievaulx is a Cistercian Abbey founded in 1132 and sits in a Valley on the North York Moors. I called in there the other day after having visited Byland Abbey just a few miles away. Even after the ravages of Henry VIII’s “disolution” in 1538 it really is still a magnificent structure. Owned by English Heritage it is really well looked after and maintained. 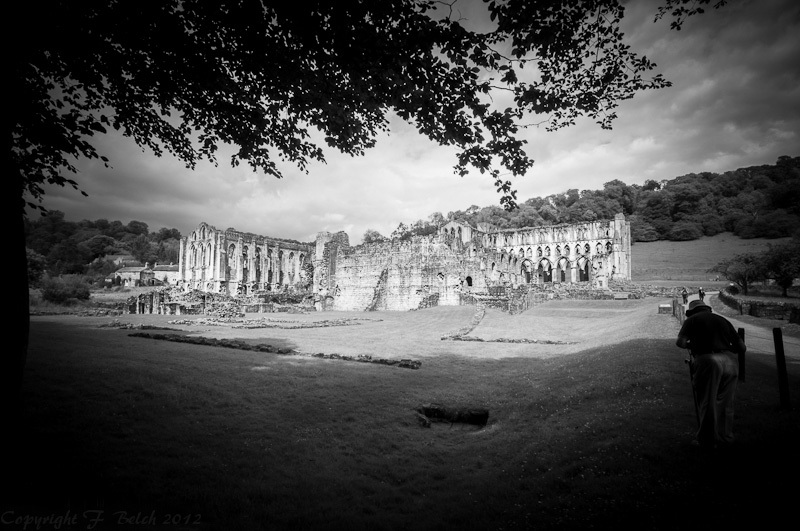 The best views of the Abbey, in my opinion, are from Rievaulx Terrace which is high up on the hill adjacent. The terrace is owned and operated by the National Trust. Anyway I couldn’t resist taking this picture of a gentleman taking a picture, not sure if anyone was behind me taking a picture of me taking a picture of . . . . enough! It’s a magificent structure, one I very much hope to visit some day. Have you explored any of the smaller Cistercian ruins in the north?